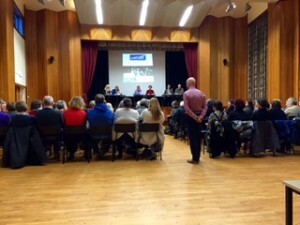 The Fife Upstart hustings “Was one of the most enlightening hustings I have ever been to.” said Willie Rennie, Leader of the Liberal Democrats in Scotland at Elmwood College, Cupar Wednesday night. The meeting, attended by more than a hundred people, heard teachers, parents and mental health workers who overwhelmed the Scottish Parliamentary candidates with their passion, despair and frustration for Scottish children’s early years experience. The growing movement, which has nine local networks of enthusiastic supporters right across Scotland even before its national launch in May, argues that to help Scotland’s children gain their full potential and avoid teenage mental health problems they need more time for free play in their early years. “I have not seen a test that could effectively test creativity or imagination,” said Scottish Labour Candidate Rosalind Garton. While Willie Rennie said that he thought the SNP would regret testing in Primary Schools. Scottish Conservative Candidate Martin Laidlaw said that he thought the system needed re-structuring but did not advocate changing the school starting age. Andy Collins, Scottish Green Party candidate, said testing of any sort is detrimental until at least eleven. The Fife branch of Upstart Scotland is part of the campaign to change the school starting age in Scotland to seven. It is demanding a change in early years education through the introduction of a state-funded kindergarten stage for Scottish children aged three to seven with an emphasis on the outdoors. Children in countries such as Finland, which has the best education results in Europe, don’t start formal schooling until seven. They have a state-funded kindergarten stage from three with an emphasis on the outdoors and as a result their young people do better in school. To find out more see the group’s website: http://www.upstart.scot/ or their Facebook Page: https://www.facebook.com/upstartscotland/ or email info@upstart.scot.